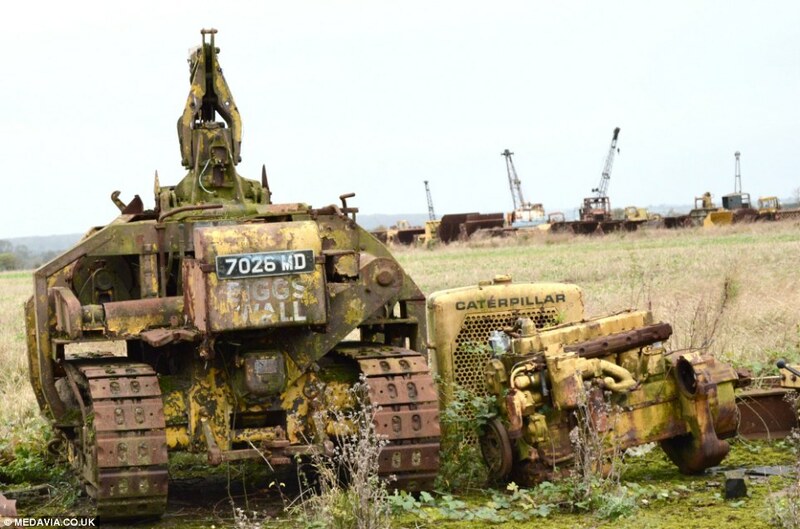 Many of these vehicles helped seal World War Two victory for Britain, including on the beaches of Normandy, but today they rest in a 'vehicle graveyard' on a former RAF base left untouched since 1963. 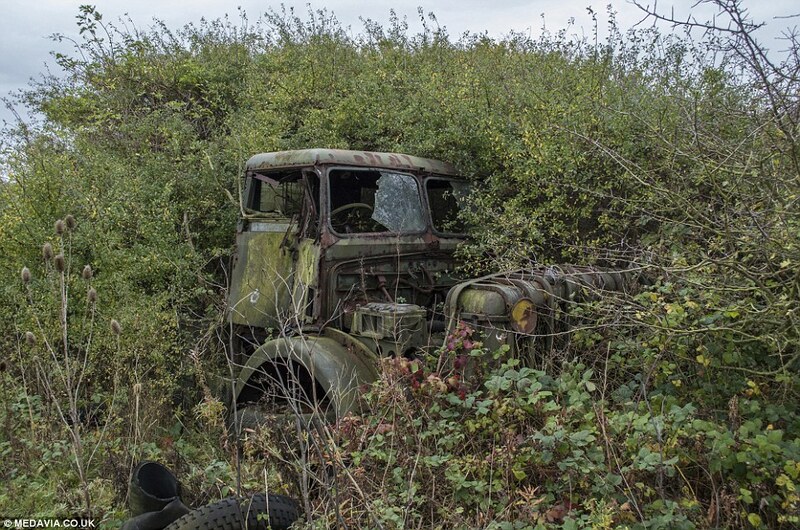 The closed military site at RAF Folkingham in Lincolnshire is home to an ageing collection of decommissioned military vehicles, farming machinery and lorries dating from the 1940s, which aided the war effort here and in occupied Europe. 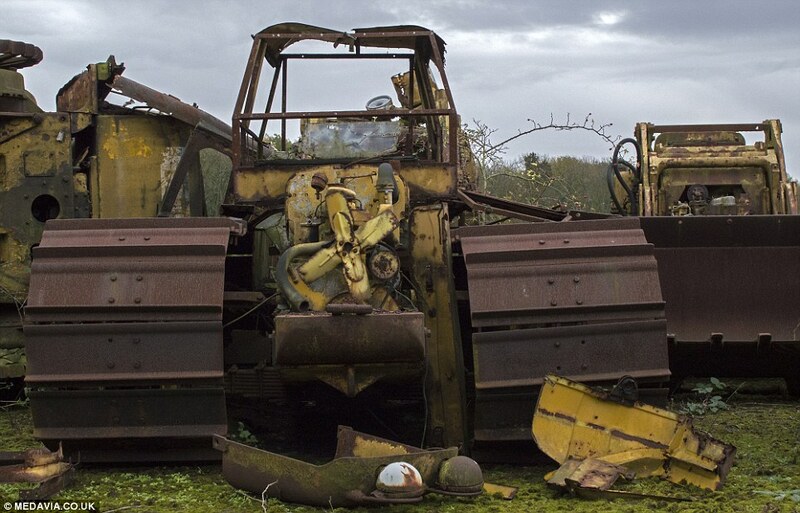 The hulking machines are parked in line, falling apart and forgotten, at the edge of the 6,000ft-long runway, some swallowed up by bushes and trees. 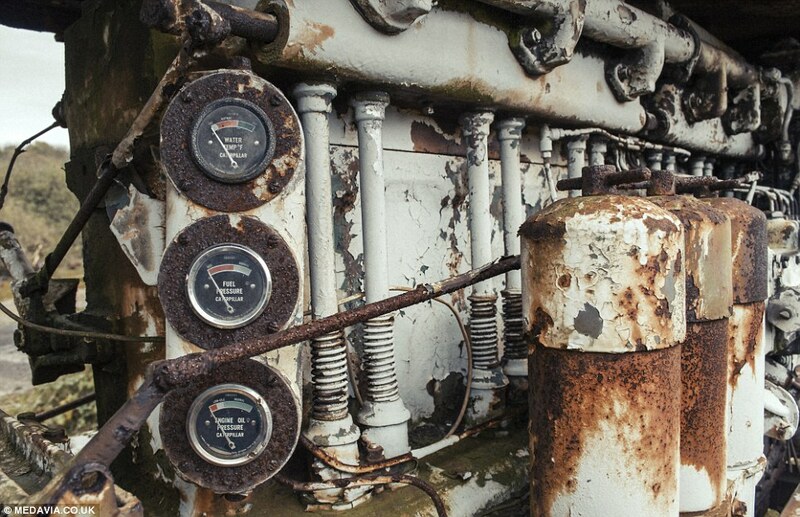 Urban explorer Steve Vernon, 36, photographed the strange collection of derelict automobiles. He said: 'It is quite eerie - the vehicles were stretched along the runway for as far as I could see. I couldn't even see the end of the line. 'Seeing all those old trucks and tractors lined up next to each other in the middle of the countryside is bizarre. 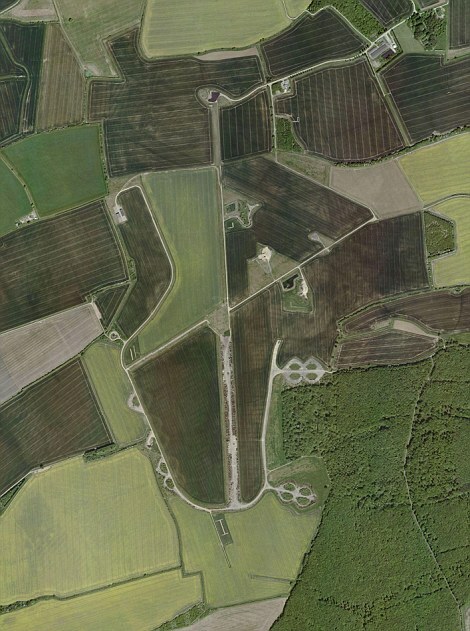 RAF Folkingham, 30 miles south of Lincoln, had a 23-year life at the heart of the Second World War effort and later the Cold War. When it opened in 1940, it was used as a dummy airfield, with fake planes and personnel, set up to draw the Luftwaffe away from RAF Spitalgate, just a mile away. Later it was brought into use by the RAF and the U.S. Air Force, primarily as a home for airborne units. Soldiers were dropped into Italy in 1944 and later on D-Day by parachute. After the war, it was a ballistic missile base, with weapons fuelled and ready to fire during the Cuban Missile Crisis in November 1962. But within a year it was closed and is now in private hands. 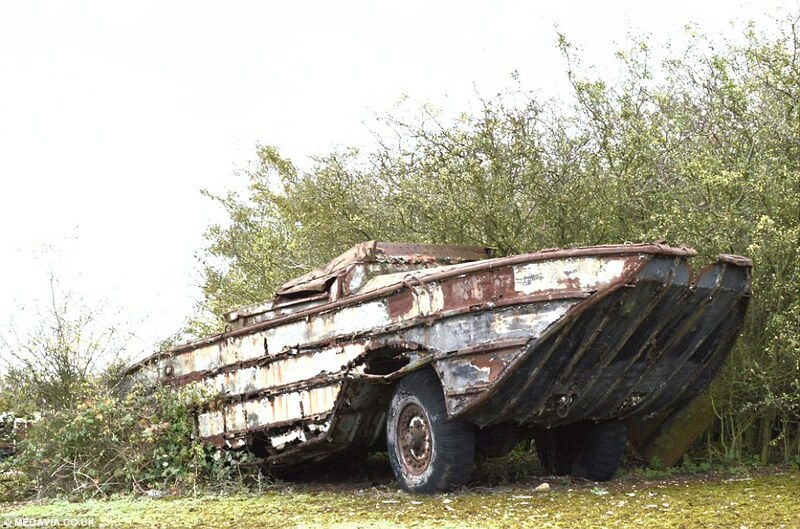 The runway is home to several decommissioned World War II vehicles including a DUKW amphibious truck - the model which was used during the D-Day landings - as well as mobile pump engines and various military trucks. 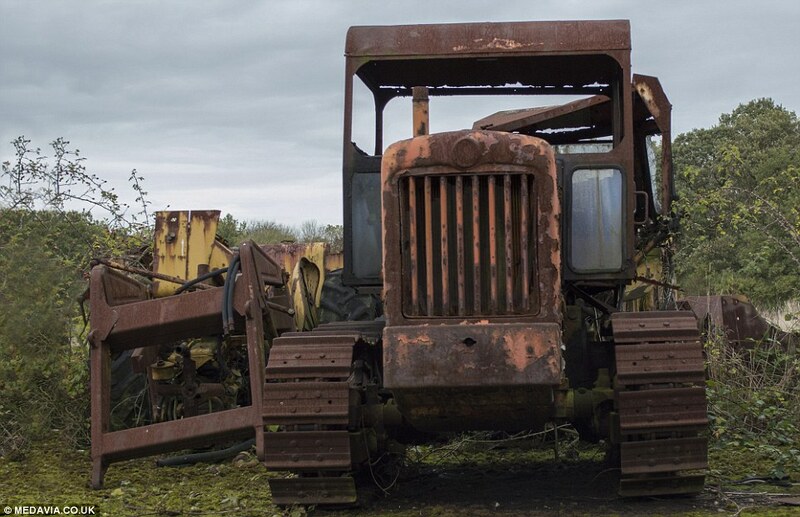 Other pieces of agricultural machinery which litter the landscape include tractors, bulldozers, JCBs and earth-movers. 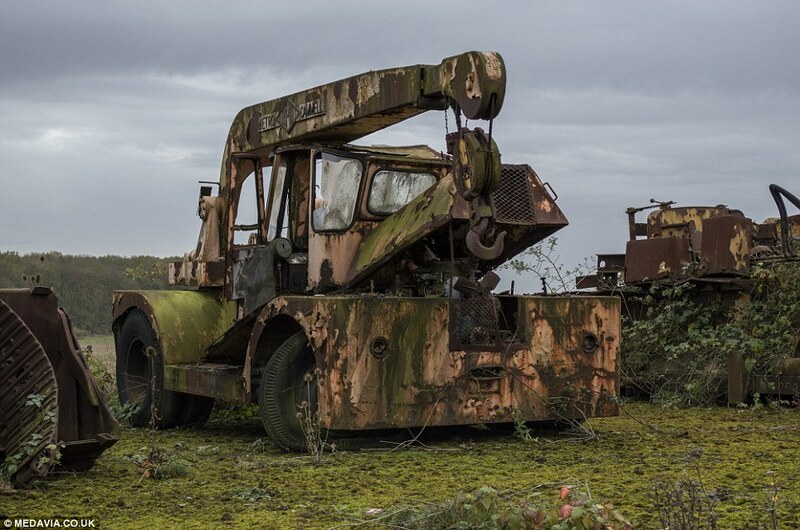 Bizarrely, Mr Vernon, from Doncaster, spotted the severed heads of two deers rotting inside an abandoned crane. 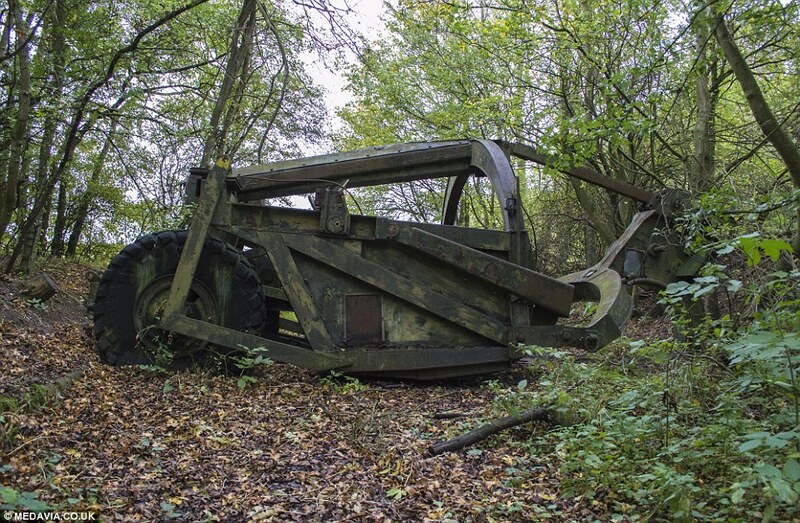 'I saw the antlers poking out of the crane and when I went for a closer look I saw two deer heads in there. One was on the drivers seat and the other was at the back of the cab,' he said. 'They can't have been there long, they were still quite intact. 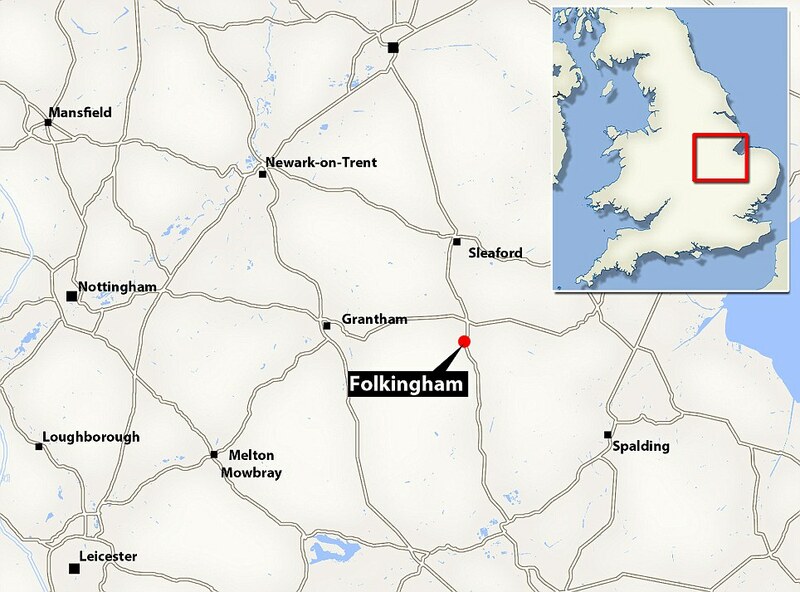 RAF Folkingham opened in 1940. During World War II it was used as an airfield for airborne units in the RAF and the United States Army Air Force. 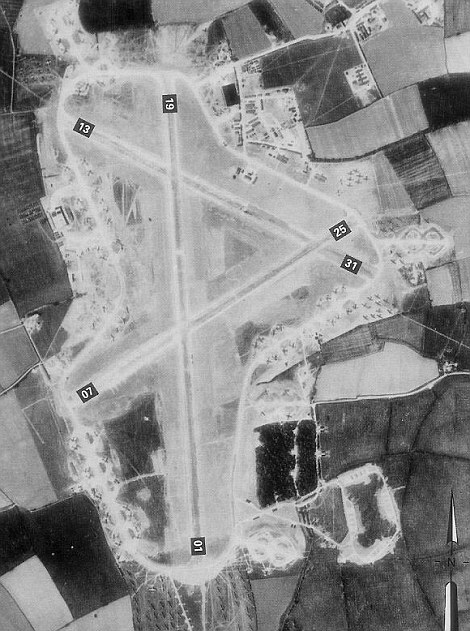 The airfield was eventually sold off in August 1963 for agricultural use. 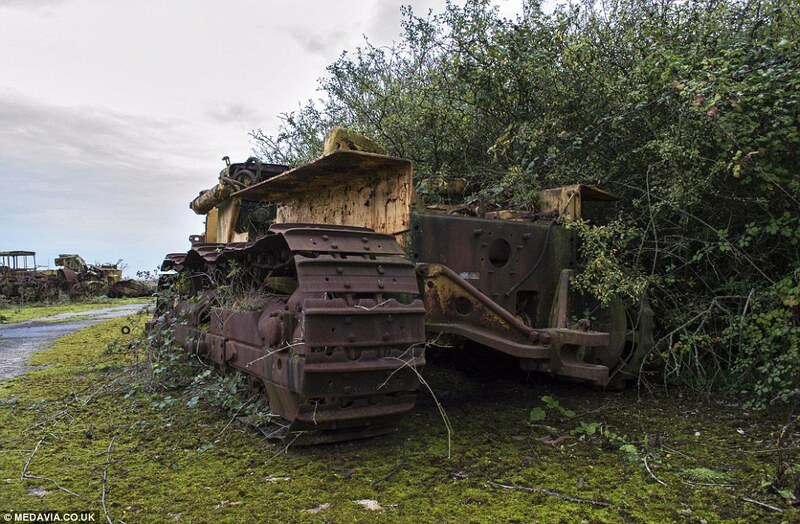 Today the remains of the airfield are located on private property. 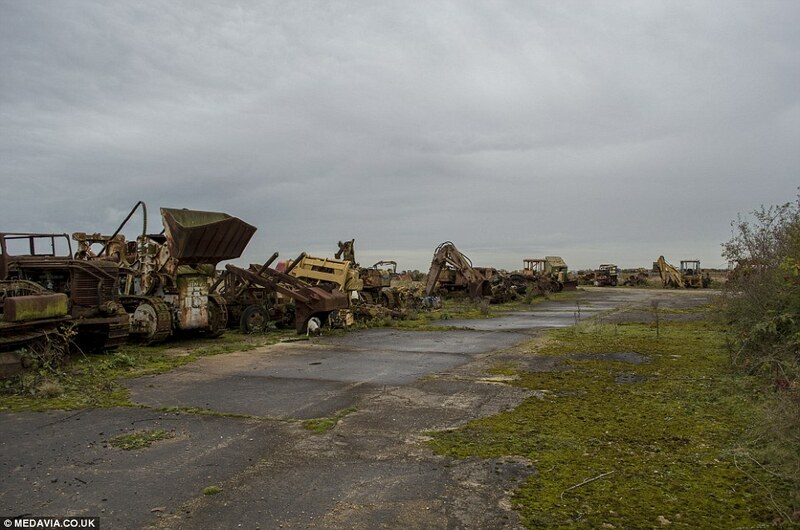 The main runway is used as hardstanding for hundreds of scrap vehicles. 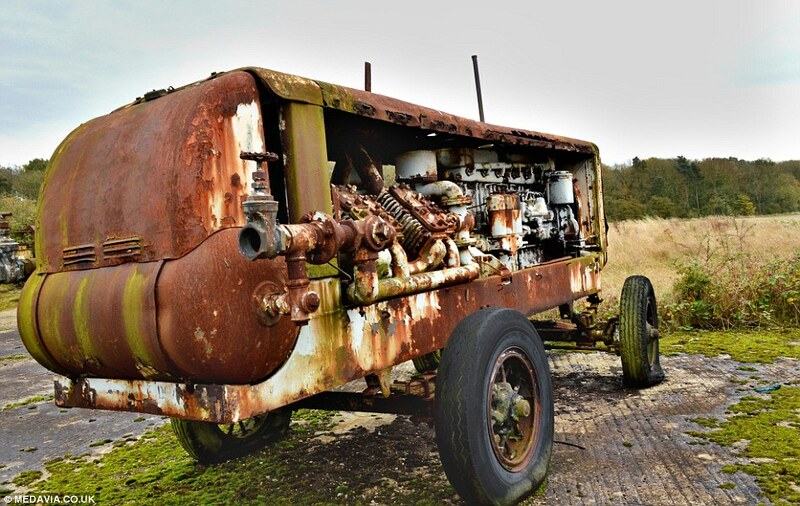 The vehicles are all owned by Nelson M Green and Sons Ltd who store the decommissioned vehicles for sale of the spare parts.